A full day of exploration and expression, learning about colored pencil as a fine art medium with Deborah Maklowski. /types of oil/wax-based and water-soluble pencils on a variety of surfaces, including drawing, printing, and watercolor paper, sanded pastel paper, drafting film, and suede mat board, while practicing new techniques and learning new skills. Find out why the colored pencil is taking the art world by storm! All supplies are included. Ellicott City artist Deborah Maklowski works in a variety of genres, including impressionist plein air landscapes in pastel, representational drawings in colored pencil, graphite and ink, and abstracts in colored pencil, acrylic and collage. Deborah studied drawing and painting with private instructors from the age of 9 through high school and continued her training in college while majoring in Art History. She maintains her professional development through workshops with nationally known instructors, networking with her fellow artists, and a focused studio and plein air practice. She is a signature member of the Colored Pencil Society of America, currently serving on the CPSA national governing board as President. 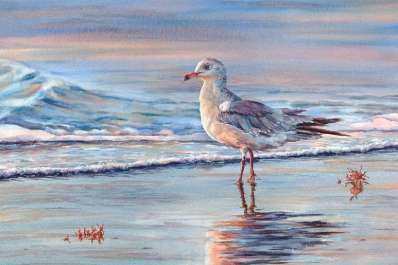 She is also a past president and signature member of the Maryland Pastel Society, a juried member of the Pastel Society of America and the Miniature Painters, Sculptors and Gravers Society of Washington D.C., and a member of the Mid-Atlantic Plein Air Painters Association and the Cider Painters of America. Her award-winning work has been juried into numerous national and regional exhibitions and plein air competitions and is included in private collections across the U.S.